This review is going to be a little bit different from my norm for one simple reason. The Amulet of Samarkand is a book that I have a long and beautiful history with. Having checked the publication date, I am pretty sure that I first picked it up probably not long after it had first been published. It was the beginning of the series that was to accompany me and be one of a few bright spots in a period of my life where my school made me very unhappy. It was a series that I read aloud to my mum in its entirety when other books were abandoned. Hell, it's one of the few books that I have actually gotten signed. I love this book. A lot. So when I realised that on my to-read list I had reached its prequel, The Ring of Solomon, I couldn't help but decide to re-read the full trilogy before I tackled the spin-off. The review will follow my general structure of plot overview followed by analysis, but there will be less focus on whether the elements discussed make it good or bad, since my opinion is stated pretty baldly here. Let us truck on then. When the djinni Bartimaeus is summoned by a pre-teen boy, his assumption is that his latest master will ask him to perform some trivial trick like levitation. What he doesn't expect is for the boy to charge him with stealing an amulet of great power and reputation from a magician named Simon Lovelace. The boy in question is Nathaniel, the talented apprentice to a mediocre magician, and he has chosen the amulet as the means of humiliating and possibly ruining the magician who publicly shamed him two years prior. What neither of them know is the conspiracy that their theft will uncover, leading them to become wildly out of their depths as they try to get out alive and in one piece. 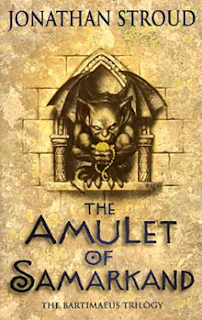 When I started re-reading The Amulet of Samarkand, I was kind of expecting it to have not lived up to the way that I saw it through rose-tinted glasses. I knew that it would still be good, but part of me expected that the magic would have faded a little; the humour wouldn't be as good as I remembered it, Bartimaeus wouldn't have been as interesting. But I found myself pleasantly surprised. Admittedly, The Amulet of Samarkand is probably the weakest of the trilogy simply by dint of it needing to do a lot of set-up, but there is still a lot that is a heck more adult than I remember it being. I guess that this had always been the more child-like installment in my mind, simply because I would have read it at around the age of 12/13. But the thing that struck me most when re-reading this as an adult was just how dark some of the central themes are. First, there's the whole slavery issue with Bartimaeus and Nathaniel. It gets expanded more in the later books, but there's a fair bit to go on here. While Bartimaeus' sections are predominantly written in a charming and humourous way, there's no way to miss just how grim his life is. Constantly being ripped away from his home and forced into the service of creatures determined to think of him as a necessary evil at the very best. There's a point where Bartimaeus learns Nathaniel's birth name, leading to a temporary redress of the power balance between them and the djinni is utterly ecstatic because at long last there is a situation that he has a modicum of control over. Only for it to be set abruptly back to the status quo. As much as I can sympathise with Nathaniel in this installment, that's a moment where I can't help but hate him a little bit in that moment. Second, it really concerns me that the adults are so useless here. Much like The Ocean at the End of the Lane, I get a really strong impression that the author was trying to impress on adult readers just how dangerous it is to forget what childhood is like. I mean, I know that useless adults is a literary device common in children's books simply to stop adults jumping into the fray and instantly solving things, but The Amulet of Samarkand really goes a step beyond that. The majority of the adults here take on a surprisingly old-fashioned view of children, namely that they are just miniature adults who happen to be worse at things than the full-sized adults are. As such, the adults here appear largely malevolent and cruel, using any excuse to restrain, silence and humiliate their young charges. It is a setting where Nathaniel is forced to grow up incredibly quickly in order to keep up with an abusive system, where his master (explicitly stated to be intended as a replacement father-figure) fails to protect him from outside cruelty and even blames him for his victim status, where the only benevolent adult figures are non-magical women whose lessons to maintain a sense of honour are well-intentioned but essentially useless. It's a setting that only reveals its true horrors when seen through adult eyes. What makes it worse is that what these abusive systems are creating from their apprentices are adults who don't really have any functional skills. When Nathaniel briefly hits rock bottom, he has to rely on Bartimaeus to provide all of his essentials like food and shelter. But even he's not as bad as the adults in the climax. When they are confronted by the antagonist's master plan, their first course of action is to throw magic at it and hope that it goes away. When that doesn't work out, they run out of options and start panicking. At no point do any of them consider non-magical means to tackle the villain. Honestly, this is the only children's series that I can think of that makes the whole "adults are useless" trope quite so horrifying, and it just adds extra depth to the already decadent and privileged magician society.